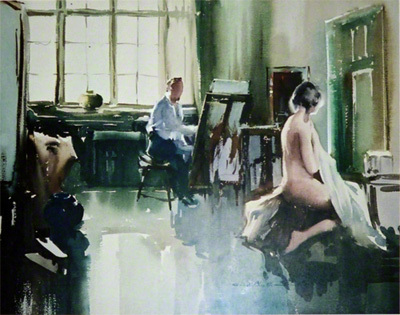 A water colour by Claude Buckle showing a model posing for the artist. In this suggestive picture neither the face of the artist or the face of model is drawn in. The large window at the back of the room is providing light which shines on the model's hair. The artist who is painting on an easel under the window is also illuminated from behind. Created in 1969.